Info "This robot loves picking up trash. Don’t ask me why." Litterbot is one of Penny's Microgames in WarioWare: Smooth Moves. 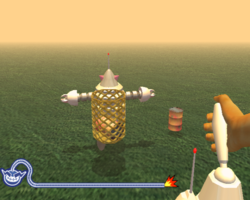 The player must control the robot with the Wii Remote and navigate it to pick up the barrels. 1st level difficulty: Three barrels on the ground. 2nd level difficulty: Two stationary barrels and one rolling barrel. 3rd level difficulty: Two stationary barrels, one rolling barrel, and a moving van. The robot will be knocked over if it hits the van. This page was last edited on February 20, 2018, at 16:33.